RenWeb School Management Software is our school management system, including ParentsWeb – a private and secure parents’ portal that will allow parents to see academic information specific to their children, while protecting their children’s information from others. Step 1: To set up your ParentsWeb account, go to https://ms-ia.client.renweb.com/pw/. We recommend that you bookmark this page for future use but we have also created a quick link from the bottom right corner of any page of this website. Step 2: The first time you access ParentsWeb, you will need to click on “Create New ParentsWeb Account.” This will ask you to submit an email address and will then send you instructions on how to create your username and password. If you do not know what email address the school has on file, please contact the Central Office, 641-472-9400 1174. Step 3: Once you have completed and successfully saved a username and password, you must return to the log in page: https://ms-ia.client.renweb.com/pw/. Your password must contain both letters and numbers and be at least 6 characters in length. 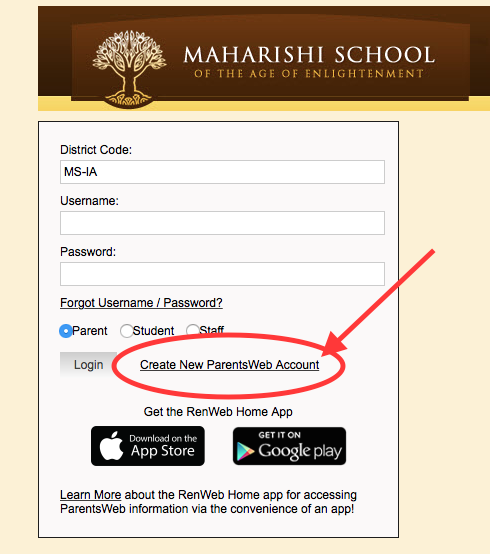 Now you can enter ParentsWeb using your username and password!!! Step 4: Explore the menu of items on the left side of the screen. From here you can access features such as a Calendar, School Directory, Homework, Grade Book, and much more! Please check back here on a regular basis for updates and changes or find contact information for your child’s class, homework assignments for the week, etc.